Den erbjuder maximal säkerhet, komfort och snabbhet. Piaggio MP3 har två framhjul, körs på vanligt B-körkort, men besitter samma egenskaper som en vanlig MC. Vid trafikljuset låser du framhjulen och du behöver inte sätta ner fötterna i marken. MP3 bromsar också på tre hjul vilket kortar bromssträckan upp till 20% mot en vanlig MC. MP3 har den senaste generationen av motorer med elektronisk bränsleinsprutning och ett imponerande vridmoment. Som bonus blir du miljösmart & slipper vägtullar, köer och parkeringsproblem. Unikt med Advanced versionen är utrustad med backfunktion. Beräknas ankomma i Juni 2019 till Sverige. With MP3 Piaggio has skilfully reinvented urban mobility. The Piaggio MP3 is the world’s first three-wheel scooter, a concrete response to the demand for easy-to-handle, extremely safe city vehicles that can get about in the city or reach the city centre from the ever growing suburbs. The two front wheels and exclusive patented suspension system that connects them combine the safety of a car with the simplicity and practicality of a scooter and the fun of a dynamic motorcycle ride on a twisty road. This is why Piaggio MP3 is able to satisfy truly global demand: from drivers looking for a more practical yet safe alternative, to the experienced motorcyclist able to appreciate the advantages and technical features of a vehicle that has single handedly created a new market segment of which it is the undisputed leader. The new Piaggio MP3 range represents the pinnacle of technological excellence applied to Piaggio Group scooters. The 350 and 500 cc engine sizes are able to satisfy all urban and non-urban mobility needs: Piaggio MP3 500 hpe is now available in three different versions, Business, Sport and the new Sport Advanced, each characterised by different colours and equipment, while Piaggio MP3 350 is available in just one version, and takes up the Piaggio MP3 500 hpe Sport colour range. All models can be ridden with a car driver’s licence. With the arrival of the flagship Piaggio MP3 500 hpe Sport Advanced, the Piaggio MP3 range is now complete. The world’s first three-wheel scooter in 2006, Piaggio MP3 has always stood out for its ability to innovate, consistently one step ahead of everyone else. In 2007, Piaggio MP3 brought the very first application of a hybrid engine to a three-wheel scooter, while in 2014 Piaggio MP3 became the first three-wheel scooter to be equipped with ABS and ASR systems. Today, Piaggio MP3 also becomes the world’s first three-wheel scooter to have a reverse gear. The Piaggio MP3 has a modern and elegant look that incorporates clear references to the car world with its refined finish and high level of perceived quality. The grille featuring on the front shield, designed by the Piaggio Group’s Centro Stile, is paired with modern turn signals complete with LED technology. In terms of comfort, the smoke windscreen presents integrated hand protectors, while the seat makes use of comfortable foam. Important details that, in addition to the already perfect handlebar-seat-foot board triangulation, underscore the Piaggio MP3 attitude to touring and sustained daily riding. Great attention has been paid to the comfort of the passenger, who can enjoy a comfortable portion of the seat, as well as a backrest and ergonomic grab handles. The passenger can therefore adopt a relaxed riding position, thanks also to the presence of pull-down foot pegs. The large under-seat compartment, complete with courtesy light and mat, is designed to ensure maximum usage; the roughly rectangular shape, without layers or separators, ensures that every square centimetre can be used. There’s room to comfortably fit two full-face helmets or a computer bag. The seat opening mechanism, which can also be activated remotely with Bike Finder (remote turn signal switch-on), is electrically powered and assisted by a practical damper to ensure safe opening and closure. The dashboard includes a modern set of instruments in two conventional round panels and a multi-purpose digital panel with data on fuel consumption (average and current), average and maximum speed, fuel gauge, travel time, and ambient temperature with ice alarm. The instrument panel also includes a clock, total and trip counter and battery voltage reader. The 11 lights on the instrument panel represent high beam function, indicator usage, reserve fuel, oil pressure, warning (injection), immobilizer, ABS, ASR and four emergency lights. In the central section, just beneath the display, a series of 4 warning lights indicate: roll lock warning, engine shut-down, no roll and hand brake. Push buttons under the handlebars are used to open the saddle and switch off the ASR. The leg shield back plate has two anti-impact pads the colour of the saddle in front of the rider’s knees. There is also a convenient, retractable bag hook. The compartment above the instruments has a drawer and USB connection, ideal for recharging a smartphone and any other enabled device. The elegant and metropolitan Business version stands out for a number of refined details, such as its exhaust tip protection, chrome trim on the front shield grille, and matte grey finish of the wheel rims and central tunnel. Standard equipment also includes Vio, the first TomTom navigator designed for scooters, carefully built into the handlebar. The navigator can be charged using the USB port on the leg shield back plate and can be removed if necessary. The elegance of Piaggio MP3 500 hpe Business is enhanced by its range of available colours: Iceberg White, Universe Black and Matte Grey. The Sport version of Piaggio MP3 500 hpe stands out for its matte black finish and numerous details such as the exhaust tip protection, wheel rims, front shield grille trim and passenger handles. A further sporty touch is provided by water transfer printing on the central tunnel and control panel of the leg shield back plate. From a technical standpoint, the pair of high-performance Kayaba gas rear shock absorbers, which stand out for their sporty red colour, ensure greater traction and stability, along with , better absorption of any roughness, thus increasing comfort and safety. Front brake discs with a wave profile and a foot board with aluminium inserts are included as standard. There are four dedicated colour schemes for the Sport version: Carbon Black and Green, both matte, as well as the classic pastel White and pastel Grey, both polished. The Sport Advanced version of Piaggio MP3 500 hpe boasts the same content as the Sport and introduces the brand-new reverse gear, another world first for a three-wheel scooter. A function that further heightens the practicality of Piaggio MP3, making for easier, less physical parking even in narrow garages or in situations where there is limited room to manoeuvre, increasingly likely in the city. Reverse gear is activated via a dedicated control on the dashboard, with the engine on and the vehicle at a standstill. 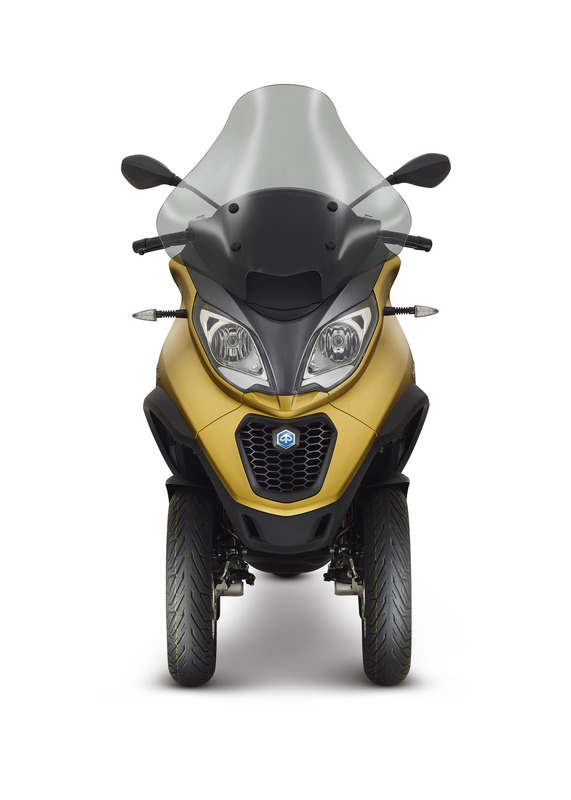 Piaggio MP3 500 hpe Sport Advanced also stands out from the Sport version for its new front headlights complete with LED technology DRL lights, its gearbox cover and its original range of colours, comprising three matte shades: Grey, Gold and Blue. The 350 cc engine supersedes the 300 cc, offering significantly heightened performance. The finish of the Piaggio MP3 350 is similar to that of the Piaggio MP3 500 Sport and includes numerous matte black details, including the 5 split spoke wheel rims. Front brake discs with a wave profile are included as standard, while red painted shock springs enhance the dynamic character of the vehicle. The 350 version comes in four dedicated colours: Black and Green, both matte, as well as the classic pastel White and pastel Grey, both polished. Piaggio’s “half litre” engine is extremely robust and reliable. The single-cylinder 500 cc, 4-valve, liquid cooled engine is fed by electronic injection; it is the most powerful in its category and adopts a multimap “Ride-by-Wire” electronic acceleration system that improves engine delivery and smoothness at low revs, and therefore the rideability of Piaggio MP3, giving the rider the possibility to switch engine mapping by pressing a button on the handlebar, prioritising either performance or fuel containment. All three Piaggio MP3 500 models are equipped with the latest single-cylinder evolution, known as hpe (High Performance Engine). The updates made to the engine serve to boost performance, reducing fuel consumption while at the same time improving the tone of the exhaust. The single camshaft distribution system with roller tappets gains a camshaft with optimised timing and valve lift speeds. The intake line can count on a generous filter box that optimises the air/fuel ratio, improving torque at low revs and ensuring an exceptionally smooth ride at any speed. The result is maximum power equal to 44.2 HP at the camshaft. Lastly, the Piaggio MP3 500 hpe exhaust system allows for a reduction in perceived noise and an optimisation of the sound, with a more sports-orientated connotation. The 350 cc single-cylinder, 4 stroke, 4 valve, liquid-cooled engine with electronic injection represents state of the art Piaggio Group technology in terms of its maxi scooter engines; already appreciated on Piaggio Beverly 350, it is considered one of the best engines ever built in the segment, in that it offers performance comparable to that of a 400 cc, yet the contained bulk and weight of a typical 300. The head-engine block-piston assembly was designed to fully optimise fluid dynamics, with solutions that can increase performance and at the same time reduce fuel consumption and emissions. The bore-stroke ratio (69 mm x 78 mm) was selected to guarantee improved output at intermediate speeds and with a partial load and to provide greater elasticity of use. The reed valve, dry-sump lubrication system reduces both loss of power due to sloshing as well as the size of the oil pan and engine footprint. Special attention was paid to reducing internal friction: roller rockers are used to reduce noise and increase mechanical efficiency. The Piaggio 350 single-cylinder is the first scooter engine to adopt a motorcycle-derived multi plate wet clutch, for better and more consistent performance even with elevated thermal stress, eliminating the possible jolts common to transmission systems when starting and ensuring an extraordinary driving experience. Such technical solutions, along with the automatic CVT (Continuously Variable Transmission), which was developed ad hoc, have brought about a weight reduction of about 10 kg compared to a 400. Crankshaft performance is very high: maximum power is over 30 HP. All models in the Piaggio MP3 range adopt the ABS anti-locking braking system integrated with ASR traction control (Acceleration Slip Regulation). The ASR (first brought to scooters by Piaggio) can be easily disconnected and guarantees safety by keeping the rear wheel from slipping on dangerous surfaces like wet asphalt. The three channel ABS system, developed in collaboration with Continental, maximizes active safety preventing wheel blockage when braking and providing full control of the vehicle at all times. 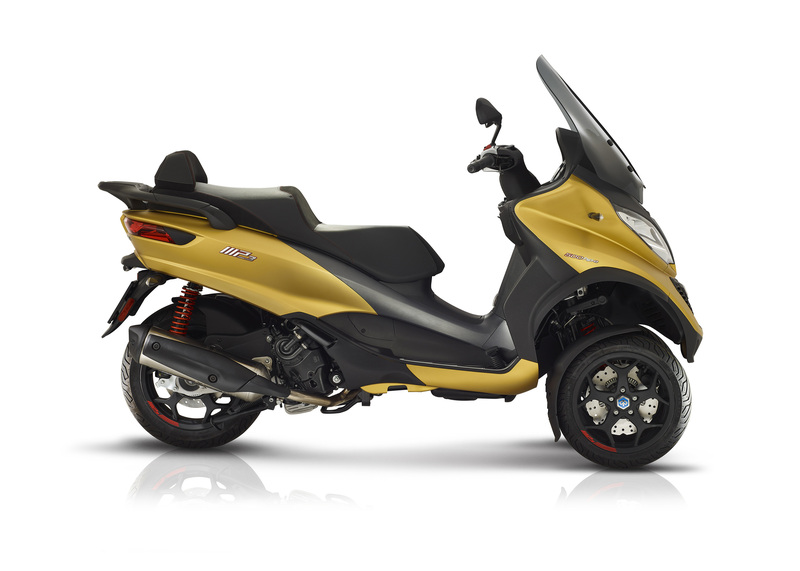 The Piaggio MP3 employs an all-disc braking system on the three wheels, with a disc diameter of no less than 258 mm. Greater safety and an even smoother ride are provided by the large 13 inch diameter front wheels. The Piaggio MP3 also owes its success to exclusive patented Piaggio technology for the dual independent, tilting front wheels regulated by a unique four bar linkage suspension, which the leading Group in Europe designed and developed before any other manufacturer in the world to ensure maximum riding pleasure in complete safety. The roll mechanism is made up of four fused aluminium arms linked to four hinges that are firmly connected to the central sleeve, and two side sleeves connected to the arms by means of pivots and ball bearings. Inside the side sleeves, the right-hand and left-hand steering tube rotates in a classic single-arm set-up. The blocking mechanism for the front suspension, a distinguishing feature of the three-wheel Italian scooter, transforms the balance of the Piaggio MP3 from dynamic to static. Start up the Piaggio MP3 and it stays in balance on the three wheels without the need for a stand (fitted nonetheless). To resume normal operation accelerate or use the dedicated push button. This means you never need to put your foot in the ground and you can park the Piaggio MP3 anywhere, easily and without effort. The PIAGGIO MIA multimedia platform, included in the rich catalogue of accessories dedicated to Piaggio MP3, allows for a smartphone to be connected to the on-board electronics system, transforming it into a multifunctional tool, a real computer able to simultaneously display information such as the speedometer and rev counter, but also instantaneously delivered engine power and torque, longitudinal acceleration, lean angle when turning, instantaneous and average fuel consumption, average speed, battery voltage and much more besides. With the smartphone connected to PIAGGIO MIA it is also possible to view maps and routes and identify fuel stations and service centres for example. The tyre condition control function exploits both the vehicle’s sensors and the smartphone to monitor tyre wear and inflation, immediately warning the user before any potentially critical situations arise, while the general analysis function allows for an overall vehicle condition check. The range of accessories for Piaggio MP3 is based on a precise design philosophy: to offer optimum on-board comfort and maximum functionality during daily usage, to enhance the role of urban commuter. The large rear top box, which can be quickly unhooked and has a 50 litre capacity, can house two full-face helmets. The upper shell is painted the same colour as the vehicle and comes complete with comfortable backrest to make the passenger’s ride more enjoyable. The top box is also available in a 37-litre version. Storage is completed with thermoformed side cases (the pair offering 42-litre capacity) and a rear top box (30 litres) that are resistant to impact and vibration and feature a rapid release system, a premium finish and a design to suit the vehicle. The optional windscreen in high quality anti-splinter material ensures excellent protection against the wind and bad weather. A great deal of care is taken regarding the aesthetics, with rods featuring the same finish as other vehicle details. In addition, the leg cover, an increasingly important accessory for commuters whatever the season and regardless of weather conditions, is specifically designed to provide maximum protection against the cold and the rain. Safety-orientated, with a design to suit the vehicle, the leg cover also offers maximum stability at high speeds. In addition to the traditional leg cover, a Comfort+ cover is available, a «hi-end» concept to maximise riding comfort all year round: designed to fit the shape of the vehicle, water-resistant, modular and easily packed away, it is coated in TPU and features an innovative anti-wave system with stiffening plates. To ensure maximum comfort in all conditions, a heated accessory kit is also available: a heated element to insert into the leg cover and heated hand grips, managed by a dedicated control unit that offers four temperature levels. Rider protection and Piaggio MP3 functionality are further boosted by thermal and waterproof hand guards, a 16-litre tunnel bag, which fits comfortably behind the leg shield back plate, an electronic anti-theft system and “seat-handlebar” mechanics. The Comfort seat, which ensures maximum comfort for both the rider and passenger thanks to gel inserts under the upholstery, is joined by the Comfort+ seat, characterised by an innovative three-dimensional elasticated material and optimised volume. Its design, with contrasting inserts and an electro-welded logo, make for an even more exclusive accessory. The special Bitubo shocks (available for 500 cc versions) offer increased comfort and vehicle response in all riding conditions and on all road surfaces. The suspension allows for micrometric adjustment of the variable pitch spring without the need for tools and adjustment of the compression hydraulics via a knob. Rounding out the accessories are a separate oil/gas tank for better cooling during intense use and an anti-vibration spring guide. TomTom Vio (as standard on Piaggio MP3 500 hpe Business) is also available. This, the first scooter-dedicated navigator by TomTom, is offered as a special, exclusive Piaggio Group edition, characterised by its personalised packaging, cover and splash screen. A new range of dedicated helmets is available with the Piaggio MP3 range, the models offering hi-tech design, safety, comfort and maximum protection. The Piaggio line of modular helmets, with thermoplastic resin shell and opening chin piece, stand out for their innovative design. The removable and washable hypoallergenic interior and micrometric fastening system, along with the retractable sun visor, external anti-scratch visor and ventilation system with multiple vents on the shell all ensure maximum riding comfort. Available in White and Army Green to match the vehicle. ECE 22-05 homologation. For short trips, urban commuting or “lighter” rides in contact with the wind, there is the Carbonskin demi-jet helmet with double visor (transparent exterior and hidden sun visor). This helmet offers a really easy, lightweight fit, with interior fittings that can be removed and washed and micrometric closure. The look is characterised by a longitudinal faux leather band that mirrors the weave of the carbon fibre, and a wide range of colours, all to match those of the Piaggio MP3. Easy to wear, comfortable and lightweight, the Piaggio summer gloves ensure excellent sensitivity on the handlebar controls and optimum comfort while riding Piaggio MP3. Safety is guaranteed thanks to the abrasion-resistant (yet elasticated) material, large reinforcement zone on the palm and the soft rubber knuckle protection, almost invisible during use. The gloves are EN 13459 certified.